From just being Smart TV OS, Android TV functioning has evolved a long way ever since its launch. At present, almost every smart TV can be converted into an Android TV with the help of few app launchers. In fact, any TV with HDMI port can add Android TV operating system with available best Android TV launcher. Here we provide the list of best Android TV launchers for Android TV and Android TV box users. Yet, you necessarily don’t need an Android TV to use these launchers. Users can make use of these launchers in any of the Android compatible devices. Essentially, Android TV launcher is a homescreen that you see on every Android operating system. Google provides a Leanback launcher by default, a simple homescreen to open TV apps, games, and other interests. The homescreen is pretty easy to use but not useful for advanced level users. There come the alternative Android TV launchers to get the maximum out of Android TV boxes. Users need to install the custom launchers to use other apps as homescreens. Here we provide a list to help you pick the best Android TV launcher. Developed by TV box manufacturers, Ugoos Android TV launcher is designed to use with a standard remote control and air mouse remotes. The only complaint is that the user interface is a bit different to the others in this list. The launcher employs a wheeled selector to toggle through different sections. However, it is very easy to get used to it and you’ll find it interesting too. The inventory management in the Ugoos launcher creates and stores apps automatically in different categories. For instance, if you stream an app, it’ll go to the streaming category. If you download a game, it will auto-populate the game category. This unique feature impresses users, particularly who use a lot of apps. This Android TV launcher is popular among people who have an older model TV box. Perhaps it claims the earliest to hit the market. Though Mediabox TV has mixed opinions among users, undoubtedly it is one of the easiest android TV launcher to use. The simple tiled widget display feature and customizable shortcuts along the bottom make it functional and easy to use. Apex TV lists in the best Android TV launchers for its simple phone or tablet look with apps and widgets. The display and layout of Apex TV launcher is very much similar to Android Phone. Considering its basic User Interface, it impresses users and provides a more Android Phone like feel. On the other hand, this theme allows users to adjust the size of app and widget tiles. Besides that, users can also place live widgets on the homescreen as per their wish. HPH TV lists as one of the best Andoird TV launcher for its theme design. The simple and easy to use theme layout gives a very clean appearance and looks stylish. You’ll find the design much familiar as most of the new boxes are based on it. This Google Leanback design like launcher provides more flexibility and great ambiance for users. Also, this provides some interesting features like adding some unofficial apps to the home screen. Essentially, this would be a great option for users who love the feel of Leanback launcher with no restrictions. The only drawback for this is the initial setup time. Once if you are done with the 30-minute setup process, you are good to go. The Ironman graphic for the online videos tile something users fall in love with the Amlogic TV launcher. The distinctive and easy to use theme attracts users with nice and large tiles. On the other hand, it has a tray at the bottom to add shortcuts to the most used apps. However, users complain about providing no option to change the main layout. This is one of the oldest launchers with the very basic layout. However, an upgraded version is out with very modern and distinctive design. The major advantage is it allows you to change the images which many other launchers don’t allow. Also, the newer version includes other improvements like the ability to customize the design and inclusion of tabs. 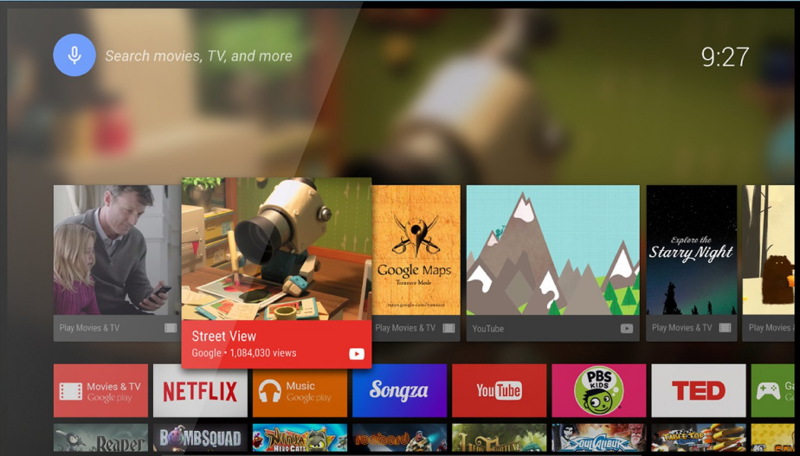 Above all, Google Plus support feature in TV launcher 3 claims to be among the best Android TV apps. Unica TV has an appealing theme with four column design, while the rest have the column design. The interface is quite simple and easy and is more reliable. The only downside of this Android TV launcher is the pricing. The familiar theme is very simple and easy tiled display which resembles Windows 8. Unlike other versions, it doesn’t offer any heavy graphics loaded design. Sunvell TV is one of the decent Android TV apps available in Google play store. As the name suggests, Simple TV touts a simple interface with quick access to apps on the homepage. Especially, users with large screens will be pleased with this launcher as it allows adjusting the size of the apps. We’ve provided the available download links from Google Play Store. You can avail the remaining by downloading them from other trusted sources. To conclude, Android TV launcher is something which helps to get most out of a smart TV. The above list provides the reference to choose best Android TV launcher. However, we do not endorse any of the above or rank accordingly. As most of the above apps are available in Google Play store, we recommend trying the free available version before choosing paid plans.